Many years back I had been staying at a Bed and Breakfast place in Pretoria while studying in the university there. This boarding house was economically suitable to students like me and was bereft of nearly all luxuries. It was run by a Philippino couple to whom I would always remain grateful. Every day morning all the boarders use to meet over a frugal breakfast after which we all moved out to our specific destinations. It was during one such breakfast get together, I noticed an elderly white gentleman who always sat alone at a table in the corner. I approached him one day and asked his permission to sit at his table. ‘No problem Young Man, Welcome’, he countered. I gave vent to my curiosity and asked him about his life. ‘You see my dear friend I actually belong to the Belgian Congo. I came to South Africa in the seventies and have been here since then. I never married and I actually live in this boarding house’. He said while applying margarine over his bread. He continued with his story over tea and sandwiches while I hung on to all his words. ‘I own about sixty odd properties in Johannesburg ranging from houses to flats in premier locations which have been rented. I have a manager who looks after my real estate and keeps in touch with me on the phone’, he revealed with a mysterious smile, ‘but he too doesn’t know my whereabouts’. ‘I was born in the Belgian Congo in Leopoldville’. He had the same look on his face as a person in South Africa who would mention about Salisbury. ‘My father had a thriving business in timber and furniture but then the revolution arrived. I and my brother had to flee to South Africa’. ‘I stay here, only sometimes I go to Paris where I have an apartment but it is philately that keeps me going. After the breakfast and going through all the South African newspapers, I am on the phone selling and buying stamps around the globe’. He concluded with a ringing laughter. ‘Now tell me, he asked, would you tell anybody about me’. I looked at his smiling eyes and the crow feet at its angles, ‘perhaps not’ I said. I had forgotten about him until recently when I saw the young rebel leader General Laurent Nkunda in Eastern Congo dancing with his soldiers. A tall handsome man, he is always found smiling. He holds a staff at all times the same way Charles Taylor use to do in Liberia. But Congo and Liberia are different and so is General Nkunda. The Belgian Congo achieved independence on June 30, 1960 under the name "Republic of Congo" or "Republic of the Congo" ("République du Congo"). Shortly after independence, the provinces of Katanga (led by Moise Tshombe) and South Kasai engaged in secessionist struggles against the new leadership. On January 17, 1961, Katangan forces and Belgian paratroops, supported by foreign interests intent on copper and diamond mines in Katanga and South Kasai, kidnapped and executed Patrice Lumumba. Patrice Lumumba who won the parliamentary elections by a big margin was elected as the Prime Minister. Much later I would come across the Patrice Lumumba Friendship University in Moscow. Following five years of instability and civil unrest, Joseph-Désiré Mobutu, now Lieutenant General, overthrew President Kasavubu in a 1965 coup. He had the support of the United States because of his staunch opposition to Communism. A one-party system was established, and Mobutu declared himself the head of state. In a campaign to identify himself with African nationalism, starting on June 1, 1966, Mobutu renamed the nation's cities: Léopoldville became Kinshasa [the country was now Democratic Republic of The Congo – Kinshasa], Stanleyville became Kisangani, and Elisabethville became Lubumbashi. This renaming campaign was completed in the 1970s. In 1971, Mobutu renamed the country the Republic of Zaire, its fourth name change in 11 years and its sixth overall. The Congo River was renamed the Zaire River. In 1972, Mobutu renamed himself Mobutu Sese Seko Kuku Ngbendu Wa Za Banga. I came across a book titled ‘The African Giant, the story of a journey’ by Stuart Cloete and published by Collins of London in January 1957. Renders had been in the Belgian Resistance and had been taken by the Gestapo. While being examined by them, he saw a girl hanging by her hand, her back completely stripped of flesh. One is surprised and shocked at ritual murder and cannibalism among Africans, and one forgets the horrors of the concentration camps of Europe –of the Gestapo, the Russian secret police, even the chain gangs of Florida and the lynchings of the South. Yet the African killings of the fetishists and doctors are to them, a form of preventive medicine, of worship and religion, which gives them some justification. This is what would happen in Africa if the white man left the country. War - a hundred wars at once. The destruction of the so called evolved or civilized blacks by the peasant farmers and a slipping back into the great African sleep from which we have attempted to arouse the continent. Stuart Cloete believed passionately on the white man, who is god chosen to lead in Africa and the ugly claws of ‘communism’ that was slowly poisoning the African mind. In his dedication he writes, ‘ I dedicate The African Giant to the white men who have given their lives to Africa….’ At no point he had mentioned the plunder of the African soil by the settlers. Many years later Mad Mike Hoare led a mercenary action in Katanga from South Africa killing thousands of men women and children by aimless firing at huts as he drove by. He also believed on the communist threat as written in his book Congo Mercenary. He lives in Durban. In May 1997, Mobutu left the country, and Kabila marched into Kinshasa, naming himself president and reverted the name of the country to the Democratic Republic of Congo. Mobutu’s generals fled to South Africa with diamonds and sacks of foreign currency. They live behind high walls, electrified gates, manned by round the clock security and protected by vicious dogs in the suburbs of Johannesburg. They remind me of Major Dalim who assassinated Sheik Mujib and continued living under such protection. I met a few of them and under conditions of anonymity told me of life under General Mobutu. It’s warm in Johannesburg in December and so is Kinshasa. Somewhere at a plush estate in Midrand, Johannesburg a deal of millions of dollars of armaments is being made. The gun sellers fuel the civil wars in Africa by selling modern weaponry made in the former USSR to all the factions. In turn lucrative deals in mining and contracts are given by the respective parties. The Zimbabwean army’s involvement in the civil war in Congo was done after such contracts were given to the generals and close relatives of the presidency. But then this is Africa. The 1994 Rwandan genocide, in which 500,000 ethnic Tutsis were massacred, left the world without any remorse. It was just another group of Africans being killed. 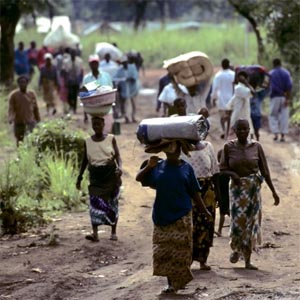 The Hutus who took part in the genocide found refuge in the neighbouring Congo. They formed their organisation, calling themselves the Democratic forces for the Liberation of Rwanda (FDLR). The rag tag Congolese warlords who don’t believe in any politics except money rally behind a group known from the colonial era, as the Mai Mai tribal fighters and now a part of a loose group with the Government Congolese army, calling themselves as Congolese Resistance Patriots Group. The presence in DR Congo of the FDLR, which has been accused by the UN of taking a leading role in the Rwanda killings, has led to the formation of opposition forces such as General Nkunda's National Committee for the Defence of the People (CNDP). The Tutsis a minority living in Congo are being systematically slaughtered by the Government forces and the Hutu rebels. CNDP was formed by General Laurent Nkunda who is a Congolese himself and allegedly being assisted by neighbouring Rwanda. Meanwhile at a small private airfield close to the Johannesburg International Airport, an aircraft takes off for Kinshasa. It’s nothing unusual but this aircraft was flown by a white South African, which took off without any permission and above all without paying for the craft for which a deal was being made. The craft loaded with the most modern weaponry landed safely in Kinshasa. The Russian mafia in Johannesburg to whom the craft belonged were informed too late after the bird had flown the coop. DR Congo government forces and CNDP fighters have been battling each other in the east of the country since August. More than 250,000 people have fled their homes to escape the fighting. 100000 have died to malnutrition, disease and the bullet. Government soldiers and Nkunda's men have both been accused of atrocities against civilians. UN peacekeepers have had little impact in putting a stop to the violence. It’s the same way the United Nations Peace Keepers acted in Rawanda when the Tutsis were being massacred. General Nkunda knows about it and doesn’t worry about the MONUC, the UN Peace Keeping Force in Congo. The MONUC in turn have also been blamed for atrocities and sexual assaults in Eastern Congo. Under the garb of United Nations it is a documented fact that they plundered and resorted to rapes in Liberia. But let me go back again to the Belgian Congo. Robert Edric is a Britisher from Sheffield, a prolific writer, his book titled ‘The Book of Heathen’ published in 2000 by Black Swan is a gripping story based on the Belgian Congo. Imagine how we might now be forced to reconsider our understanding of the situation were the so called heathen of the Bula Matari (Congo Free State) to contain among his multitudes men capable of keeping accounts of these terrible events of this shameful history told only once – imagine his own books and what they might tell us – imagine then how we might be forced to live with our disgraceful part in all of this. The story narrated in the words of James Charles Russel Frasier is a Map maker and a Technical overseer with the ‘Company’ which is the arm of the Belgian Government in Congo. It revolves around his friend Nicholas Frere who has killed a native girl and continues on Frere’s time in the prison. It is about the robbing of the country and the manipulation of its people by outsiders…and the manipulation of those outsiders by its people. And above all the conflicts between the varying tribes of outsiders who all have their own agenda. The world around them is changing rapidly. The horrors of the Belgian Congo are becoming known and the flow of its once-fabulous wealth is drying up. 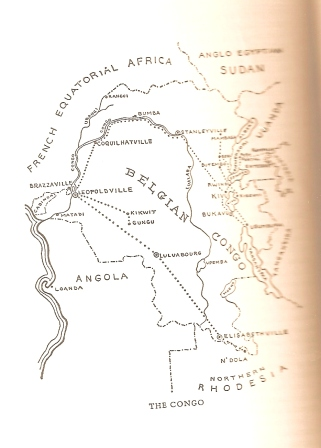 Its turn of the century and the Belgian Congo is on the cusp of independence... scapegoats must be found for the evils colonialism has inflicted. There is mention about the apparent barbarity of the local tribes - the days of cannibalism and witchcraft - against the merciless missionary and heartless trader. The colonial administrators and surveyors are portrayed as well-meaning but ineffectual, hearts in the right place…but with no real concept of the country they have taken to or what or how to deal with it. Meanwhile the war in Congo continues abated. I remember the rotund rebel General Laurent Kabila in safari suits who had visited South Africa a number of times in failed peace talks, ousted Mobutu in May 20 1997. Che Guevara assisted Kabila for a short time in 1965. He planned to bring a Cuban Style revolution which unfortunately never succeeded. Kabila used the Tutsis from South Kivu to fight against the Hutu soldiers of Mobutu. What followed was mayhem and murder till Kabila reached Kinshasa. Laurent Kabila was assassinated by one of his own soldiers on the afternoon of January 16 2001. His son Joseph Kabila became the President and found allies in Zimbabwe, Namibia and Angola. Everything seems to point at controlling the mineral rich resources in Congo. “This problem ... is created around the industrialised world wanting to get their hands on the mineral resources of the Congo," he said. "Outside forces want to rob the minerals out of the Congo and not pay a fair share for those minerals. And they've used this war as a means to push people off their land and not pay royalties and the government at all. "Ninety per cent of [the Congo's] population do not make $100 a year. So where would they buy guns from? These guns coming into this war are coming in from other sources, not the local community. "Industry works hand in hand with government ... Countries like the United States, like Great Britain, like France, like Japan, these are countries whose governments operate on the behest of their corporations. "So I hold countries like the United States very much responsible for this war." General Laurent Nkunda’s rebel soldiers have reached outside the regional capital of Goma. Kinshasa is not far to be conquered. Olusegun Obasanjo is the UN special envoy for Congo and a former Nigerian President. I saw him coming out of a tent in Eastern Congo with General Nkunda after a round of talks. The General was as usual smiling and Mr. Obasanjo looked grim. All talks have failed since then and even at the latest one held at Nairobi. The participating rebels had asked to discuss the situation in the whole country as opposed to just the conflict in the east. Mr. Obasanjo is a failed statesman in his own country. The United Nations have done a blunder by appointing him as the mediator of a complex war involving tribes, nations and people hungry for power. The ideal person would have been Archbishop Desmond Tutu. A man respected the world over; he has an intimate knowledge of African Conflicts. General Laurent Nkunda seems to have a plausible answer to the ongoing conflict. He has an infectious laughter and tells me of a war that would end the day he is allowed to explain his views. I believe that he should be given a chance. A government of national unity would bring the war to an end. But the General believes that neither the United Nations nor the African Union is keen on resolving the ongoing conflict. The participating nation's army on deputation are stationed in the safer zones of the Congo war and are paid handsomely in US dollars. The Indian soldiers spend their time playing cards while trying to ward off the mosquito menace. 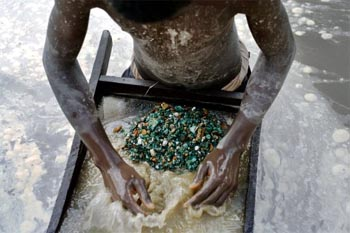 The eastern region is rich in minerals, such as tin ore, gold and coltan, underlining a decade of conflict in the region. Illegal mining has fanned both sides in keeping the war going by buying weapons from the proceeds of the sales of such minerals. United Nations Resolution 1856, which commences on January 1, 2009, authorises "the continuation of up to 19,815 military personnel, 760 military observers, 391 police personnel and 1,050 personnel of formed police units." It directs MONUC "to attach the highest priority to addressing the crisis in the Kivu province [eastern DRC], in particular the protection of civilians, and to concentrate progressively during the coming year its action in the eastern part of the Democratic Republic of Congo." 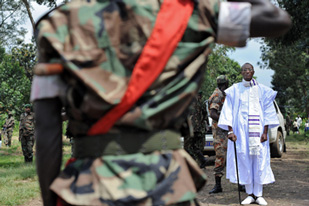 The incumbent detail of 17,000 peacekeepers have been accused by human rights groups of not doing enough to protect citizens in DR Congo, affected by increased fighting between the Tutsi National Council for the Defence of the People (CNDP) rebel forces and the army since August. As the war continues, I stumble upon yet another famous writer, Albert Russo who is of Congolese origin. I’ve known Albert for many years, having encountered his poetry on the web pages and the print media. It was in September 2008 at the World Literature Festival in Oslo, that I actually met him for the first time in person. A great guy with a fountain of knowledge on Africa - past and present, he has written a number of novels based on Central and Eastern Africa. Albert Russo was born in what is now Zaire, of an Italian father (who was born in Rhodes during the Italian occupation of the Greek Dodecanese) and an English mother (brought up in Rhodesia, today's Zimbabwe), which makes him neither Zairois, Italian, Greek, Rhodesian, Zimbabwean, or English. After primary and secondary education in francophone and anglophone Central and Southern Africa, he spent four years obtaining a degree at New York University; which does not make him American. During his seventeen Zaire-Rwanda-Burundi years he spent several months of every year in South Africa, adding up to almost four years, albeit in spaced-out instalments, during turbulent times, but this does not make him South African. He has by now spent the greater part of his life in France, but does that make him French? Jamais ! He has been translated into Greek, Turkish, German, Polish, Russian, Flemish/Dutch and Serbian, and he happens to carry a Belgian passport. Bearing in mind James Baldwin's pertinent remark, "it is perfectly possible to be enamoured of Paris while remaining totally indifferent or even hostile to the French," what do all these geographic facts make of Albert Russo? Answer as a writer, he is simply uncategorizable by nationality. Russo writes in American English and in French and has published over three hundred poems, short stories, and essays in Australia, Belgium, Britain, Canada, France, India, Nigeria, Sri Lanka, the USA, and Zimbabwe, plus more than a dozen novels published in both Anglophone and francophone countries. His poems are invariably about the human condition irrespective of geographic or national settings, and he has more than once been published in monetarily risky books of poems in English and in French within the same covers. One such book he entitled "Dans la nuit bleu-fauve" on one cover, then, turned upside down, "Futureyes" on the other. His recent collection of over 500 pages, entitled ‘The Crowded World of Solitude’, volume 2, spanning a period of 30 years, contains English and French versions of the same ten poems, and it is impossible to tell which were originally written in French, which in English; the messages are the same but the images are necessarily different, and each version sheds light on the other most interestingly, at least for those of us who are polyglots. Many of Russo's short stories have definitely American backgrounds, while others are set in Italy, Sri Lanka, China, etc. The majority of his published novels, however, centre squarely on Africa and were either adapted by himself from American English into French or written directly in French. His sixth novel, 'Zapinette Video', which is now part of a series, has nothing whatever to do with Africa. It will be seen, then, that in terms of subject matter too, he his uncategorizable." I attended Athénée Royal Interracial in Usumbura (Bujumbura) for 6 years, along with Hutu, Tutsi, Pakistani, Arab and Indian students, a unique experience in colonial Africa, which gave me a cosmopolitan weltanschauung. After New York University where I majored in Economics and minored in Psychology, I spent 1 year at Collegium Palatinum in Heidelberg, Germany, where I studied German culture and literature. Then I lived 8 years in Northern Italy, before going back to NY where I worked for Unicef and taught languages to UN staff, translating for magazines such as World Press Review and publishing in US literary magazines and anthologies. His book, ‘The Benevolent American in the Heart of Darkness’ is an internationally acclaimed novel trilogy, ‘The Black Ancestor’, ‘Eclipse over Lake Tanganyika’ and ‘Mixed Blood’, set in the former Belgian Congo and Rwanda-Urundi. It was published by Xlibris in 2004. The book is a semiautobiographical novel which reveals the beauty of a part of Africa that has been incomparable, the people who lived there integrated to the environs that made them proudly Congolese and the desperate struggle in the later years to part with an identity that they have been born with. Exiled in different countries, they all share the same dream every night, happiness and laughter in a land that was once so full of hope. The story is about Leodine who comes to know that she is actually colored, her great grandmother being an African-American with a light complexion. It is a riveting story of love, life and conflicts that rages within every colored person in Africa. 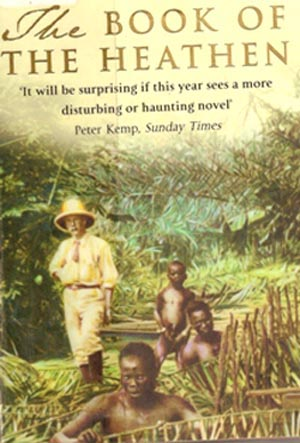 Albert Russo has brought this turmoil of an African in a narrative that the reader finds difficult to keep down the book. As an African, I enjoyed it far more, being so close to my daily life. 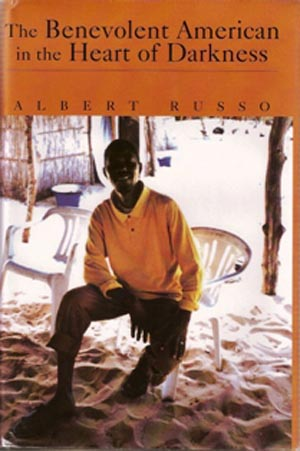 Albert Russo is a master of African Literature, and, as opposed to Westerners who find it so difficult to understand the African sentiment, Albert has brought into life that period of the Belgian Congo and Rwanda which very few Congolese writers could shed light on. My friend Brett Beiles is a well known poet living in Durban. His father was a popular medical practitioner who had the support of a clientele of every racial group and was equally loved by all. I asked Brett if he knew of any Congolese writer living in Durban. To my greatest surprise he introduced me to Jean-Marie Spitaels who happens to be a medical practitioner like me. I sent Jean the links to Congo Connection 1 and 2. From childhood in Europe to the present days in Southern Africa, the author, a retired medical practitioner will take your hand to lead you from the slimy cobblestones of the North to the quivering swamps of the South. Forget historical or geographical accuracy but listen to a story told by a bard about events which took place in some fairy land. An infant has memories of American and German soldiers; an adolescent discovers the aloofness of bush hunting but ends up as a medical man, disgruntled in useless service. Inner peace is found at last by writing for those children whose soul has not been devoured by modern machinery. I am not sure how I can help you any further short of translating the whole book in English and I prefer somebody else would do that. I beg to differ about some of the "facts" reported in your articles. 1 : Patrice Lumumba was not kidnapped by Belgian paratroops but by the Congolese army under the orders of Mobutu. I was a medical student in Leopoldville at the time of (July 1960) independence and the speech delivered by Lumumba then, full of hate, reminds me of how Mugabe speaks now. 2 : Mike Hoare was a soldier, and a good one at that, he could indeed control his men, to the degree of shooting the rogue ones! 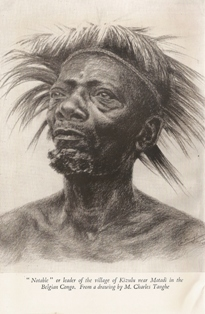 He was confronted with mobs of indoctrinated (and drugged) youngsters who believed in being protected against bullets which would then be transformed into water (May in Swahili) by the sheer power of the mind. So those kamikaze men, armed with spears, charged at the mercenary shouting "May Mulele". What would you have done in the position of Mike Hoare, Sir? Have you been confronted by an African mob? I have. 3 : "Evil colonialism has inflicted ?" I met wonderful men and women in Congo who dedicated themselves to uplifting the life conditions of local populations. My uncle, Franciscan missionary, was one of them. I added my little bit. I believe Africa, like the Phoenix, will come back reborn from his cinders when it stops blaming the "white man" for all its ailments. General Laurent Nkunda breaks into a hearty laughter when I ask him about his possibilities of him becoming the President of Congo. Refraining from answering my question he says 'I want people like you with me who understand the heart of Congo'. South Africa lost the chance of attracting the best brains from all over the world when it resorted to democracy.